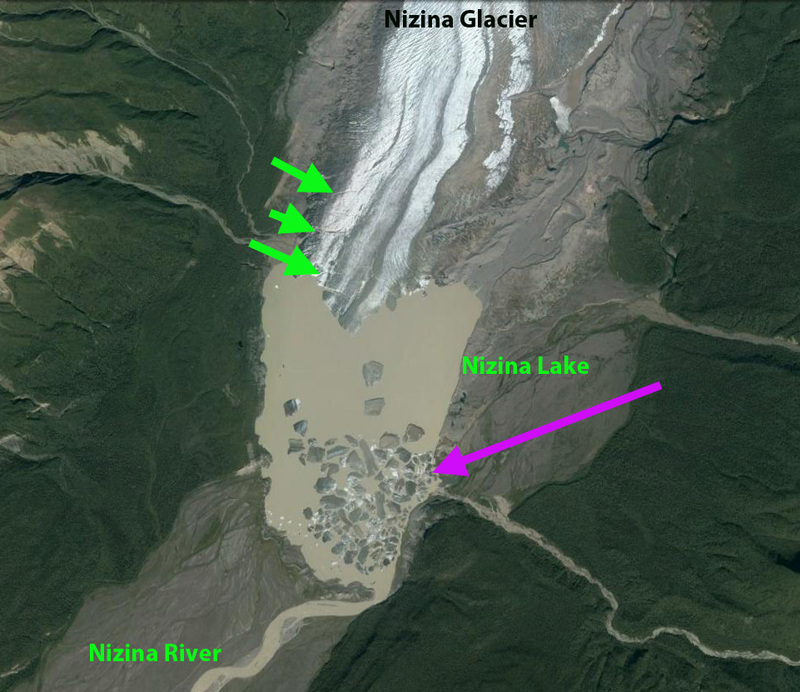 If you have heard of Nizina Glacier in the Wrangell Mountains of Alaska it is probably because you have contemplated a float trip down the Nizina River from Nizina Lake. In 1990 there was no lake, since 2000 the lake has provided a good location for float planes to land. In 2014 the lake has reached a new maximum in size and minimum in icebergs on its surface. 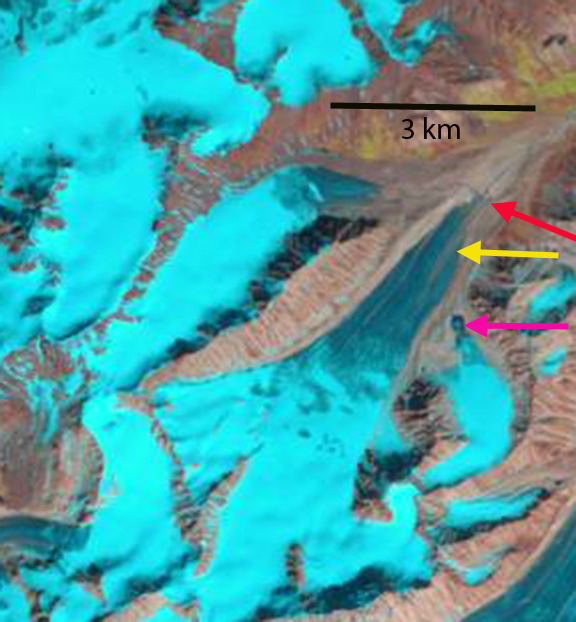 Here we examine Landsat imagery form 1990-2014 to identify changes in the Nizina Glacier. 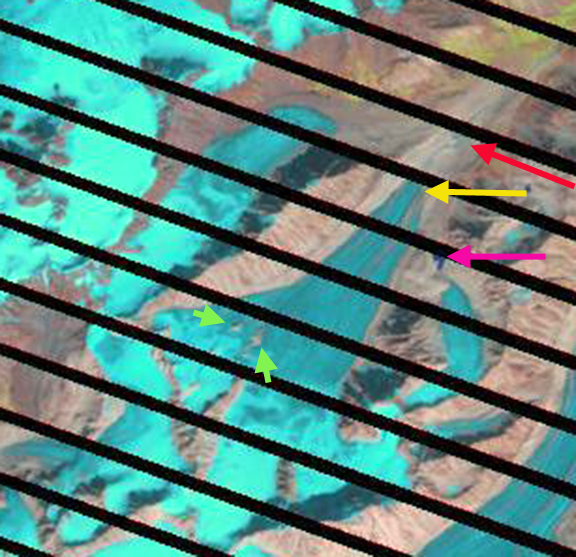 The main tributary of the Nizina Glacier is Regal Glacier indicated by the dark blue flow arrows. 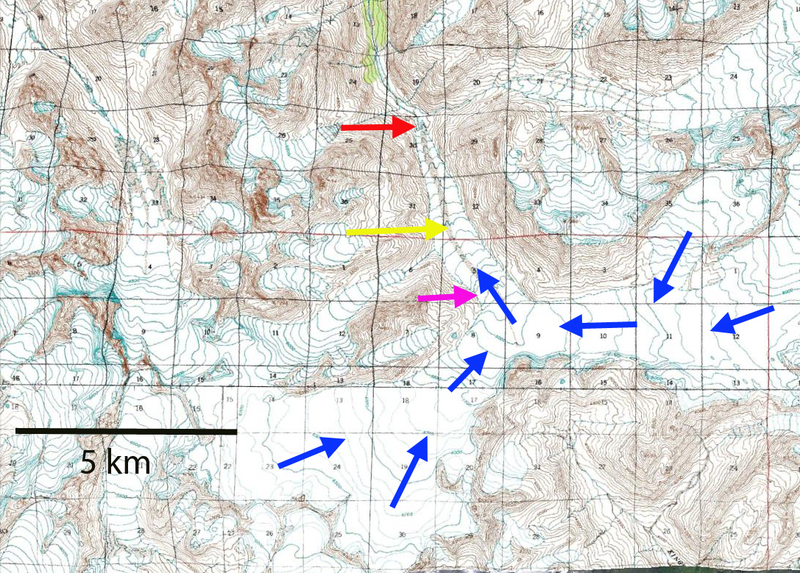 The light blue flow arrows are from the Rohn Glacier tributary that no longer reaches the terminus area. In each image the yellow arrow marks the 1990 terminus, red arrow the 2014 terminus location and pink arrows the summer snowline. 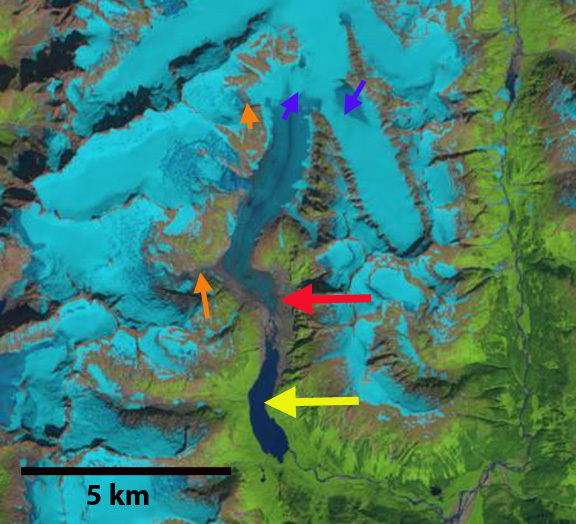 In 1990 the glacier had narrow sections of fringing lake evident, though the glacier reached the southern shore of the developing lake at yellow arrow. 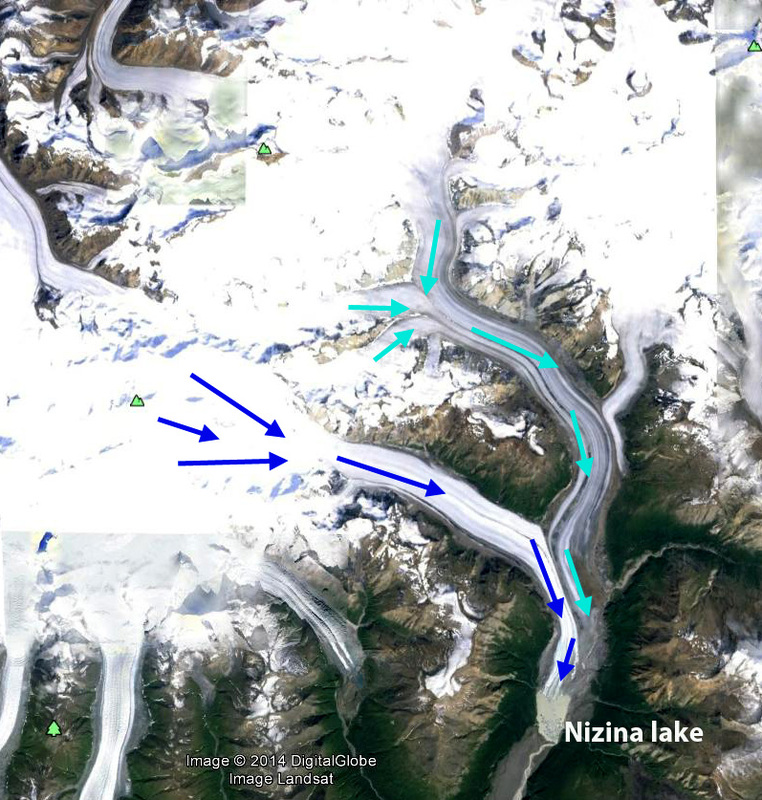 By 1995 the lake had developed to a width of 100-300 m fringing the shoreline around the terminus of Nizina Glacier. In 1999 the main lake has developed and is 1.6 km long and 1.3 km wide though it is still largely filled with icebergs. In 2013 there are a few icebergs left in the lake. In August, 2014 the lake is free of icebergs for the first time, which does mean more will not form. The lake is 1.4 km wide and 2.3 km long. 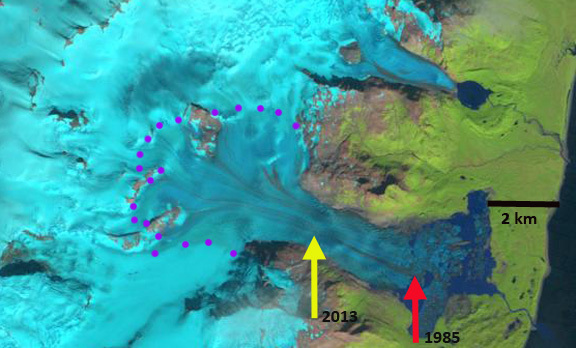 The glacier has retreated 2.1 km from 1990 to 2014, a rate of 150 m per year, red arrow marks 2014 terminus. A close up view of the terminus in Google Earth from 2012 indicates numerous icebergs but also substantial rifts, green arrows, that will lead to further iceberg production and retreat. 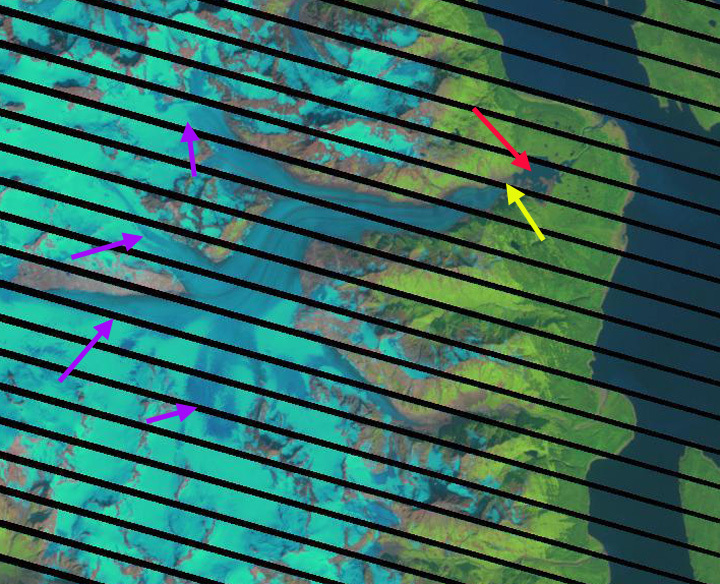 The snowline in this late July or early August images is typically at 1800-1900 m, pink arrow, with a month still left in the melt season. 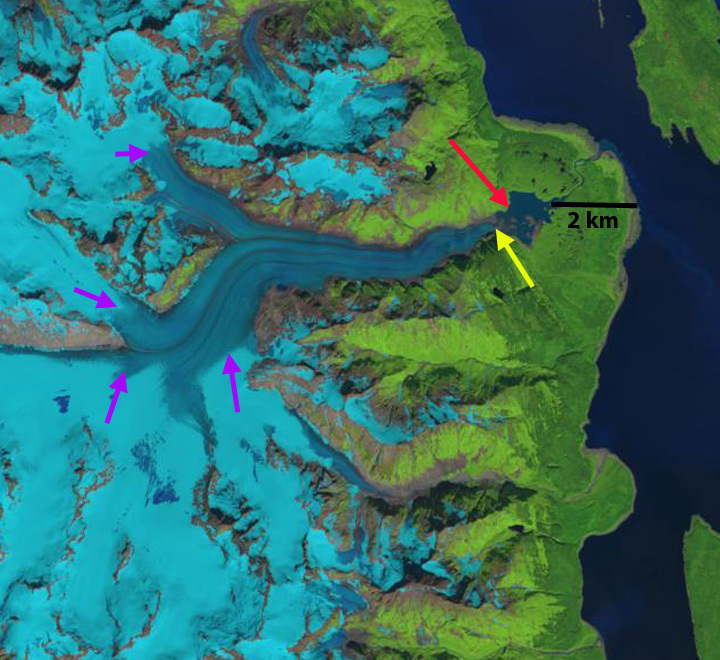 The retreat of this glacier is similar to that of glaciers in the Talkeetna Range to the west South Sheep Glacier and Sovereign Glacier and Valdez Glacier to the south. Davidson Glacier is a large glacier that flows east from the Chilkat Range to the foreland along Chilkat Inlet and Lynn Canal in southeast Alaska. As a result it has a long history of observation of change. Molnia (2008) noted that from 1889 to 1946 the glacier retreated 400 m and a lake had developed at the terminus. By 1978 the glacier had retreated another 700 m with the proglacial lake at the terminus further expanding. Molnia (2008) futher observed a 700 m retreat by 2004. 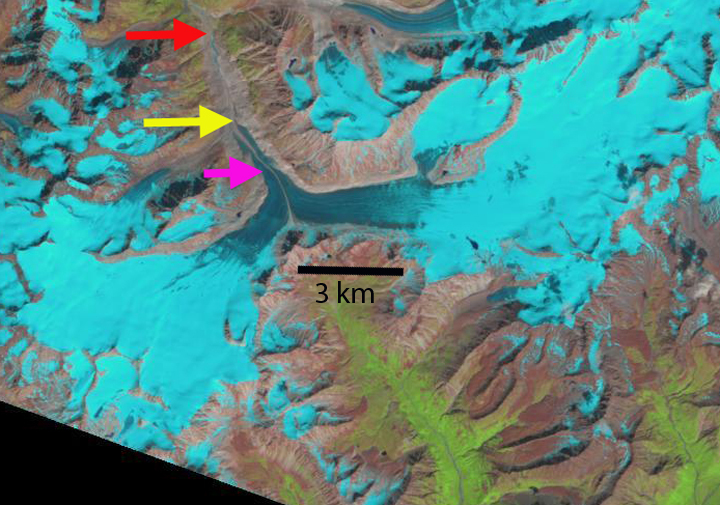 Here we examine Landsat imagery from 1993 to 2014 to identify recent changes of the glacier. 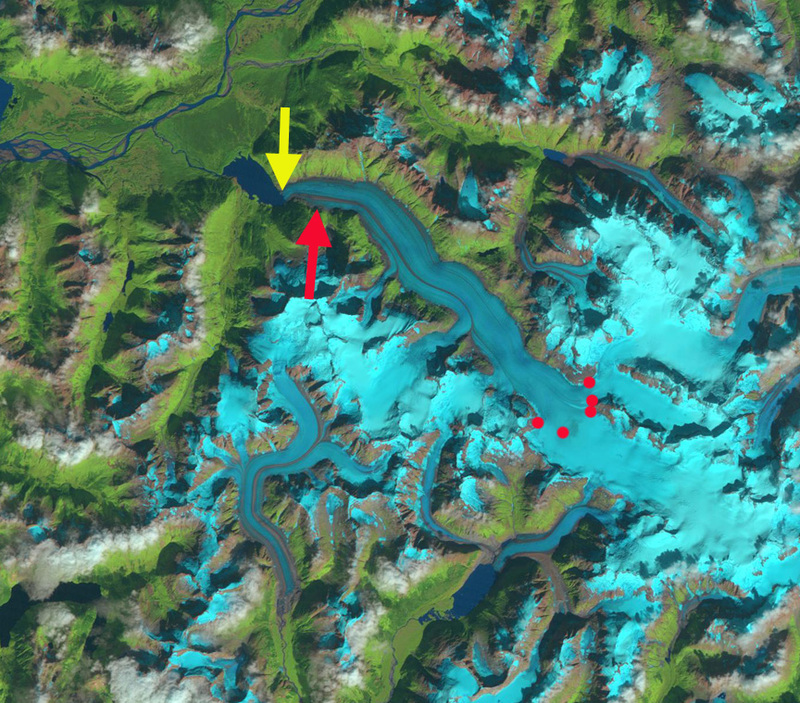 In 1984 the glacier terminated at the end of a peninsula extending from the south side of the proglacial lake, red arrow. 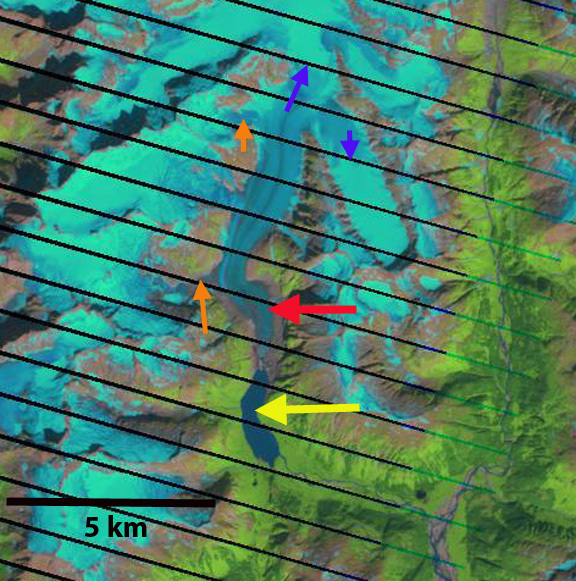 The purple arrow is the snowline at 1100 m. The orange arrows indicate two tributaries feeding the main glacier. By 2001 the terminus has retreated 500 m into a narrower western section of the lake. In 2004 the snowline is at 1250 m, leaving little accumulation area. In 2009 the snowline is at 1200 m. The terminus has retreated from the proglacial lake. 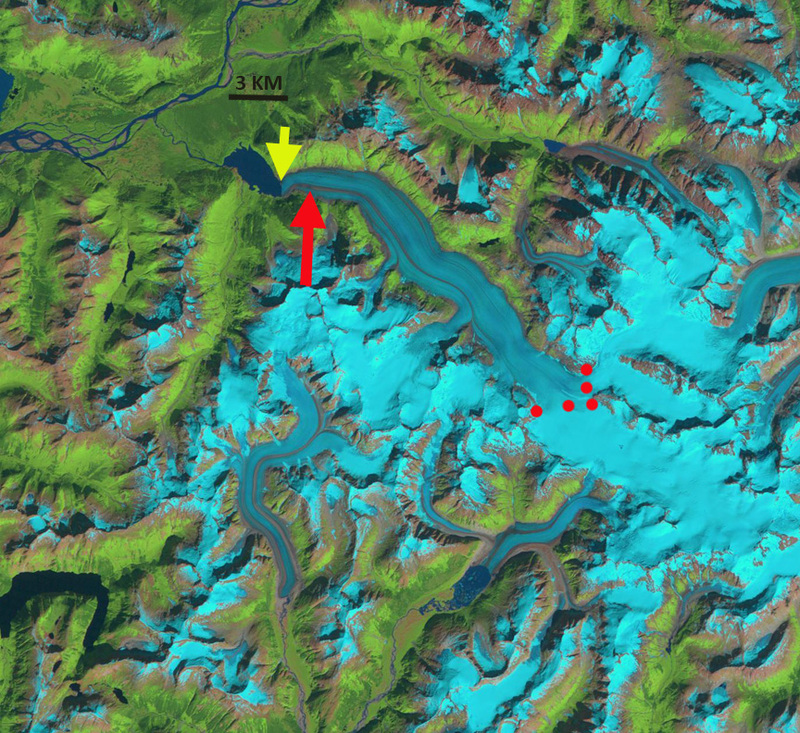 In 2013 the snowline is at 1100 m, there is a river connecting the terminus at the yellow arrow to the proglacial lake. The glacier no longer reaches the foreland having retreated into a mountain valley. In 2014 the snowline was at 1300 m at the start of August with a month left in the melt season. 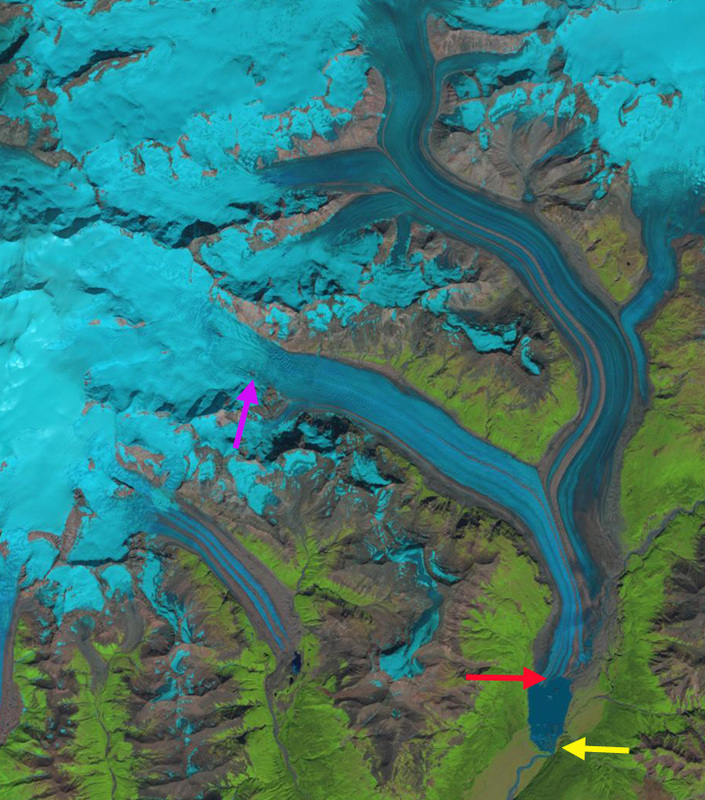 The two tributaries at the orange arrows only have a thin connection to the main glacier. The terminus has retreated 800 meters from 1984 to 2014. The retreat will continue due to the high snowlines in recent years and tributary separation. The retreat is less than most nearby glaciers such as Sinclair Glacier or Ferebee Glacier, just east across Lynn Canal. Johnson et al (2013) compare changes in Davidson and Casement Glaciers that share a flow divide at 1200 m, Casement Glacier flows west and Davidson Glacier flows east. Both glaciers thinned at a rate of 1 m per year at the flow divide from 1995-2011. This is an indication of the high snowlines and negative glacier mass balance. Casement Glacier had a much greater thinning below 600m than Davidson Glacier, which leads to greater retreat. 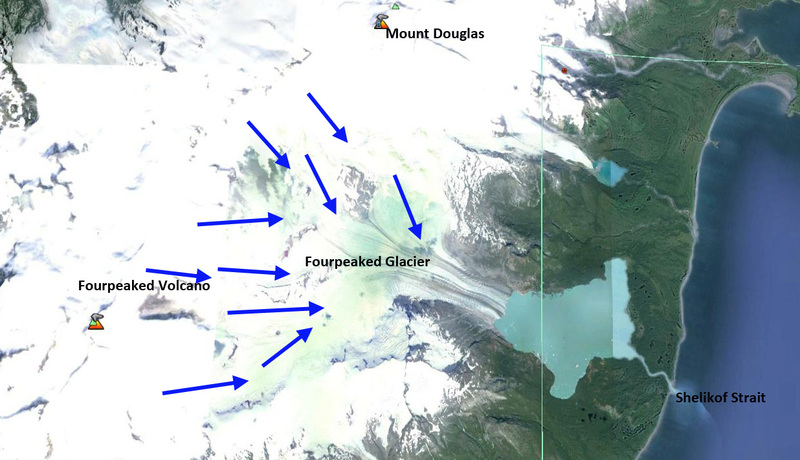 The difference is that Davidson Glacier has a steeper gradient from the terminus than most glaciers. 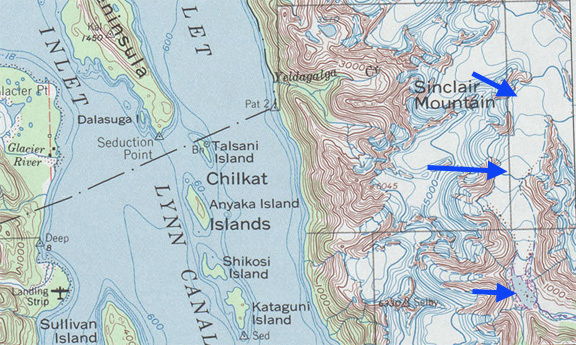 Sinclair Mountain is on the east side of the Lynn Canal in southeast Alaska. The mountains hosts too substantial glacier, the south flowing unnamed glacier is referred to here as Sinclair Glacier. This glacier terminated in a lake in the 1982 map of the Skagway region. I observed this glacier from the air in 1982 and it was ending in this lake. Here we examine Landsat imagery from 1984 to 2014 to identify changes. 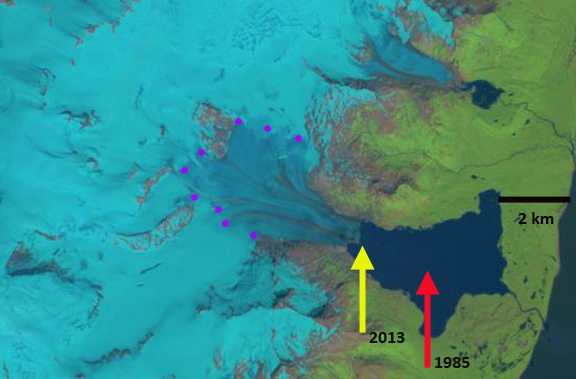 In 1984 the glacier ended at a prominent peninsula in the lake, red arrow in each image, the lake was 1700 m long. 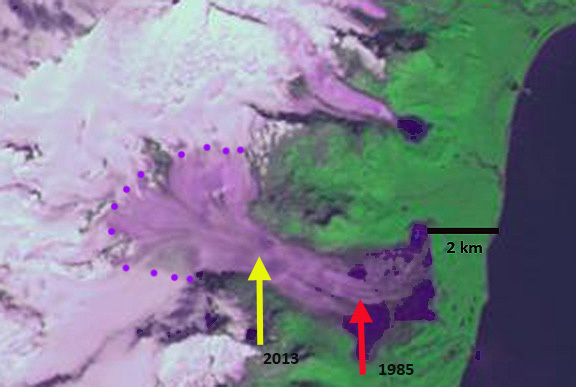 The snowline was at 950 m, indicated by the purple arrow, this was at the end of the melt season. 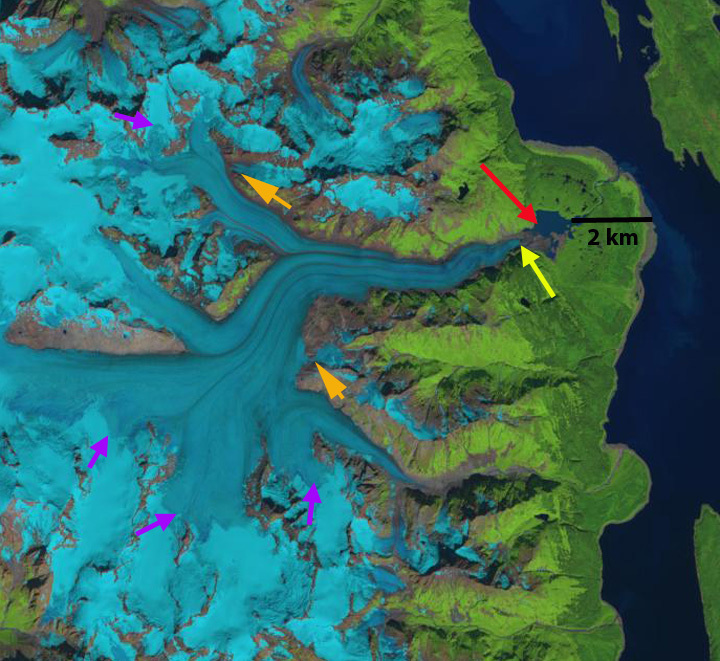 The glacier was joined by two tributaries from the west side, orange arrows. In 1986 there is a small amount of terminus retreat visible. By 2001 the glacier has retreated out of the lake, which is 2.9 km long. 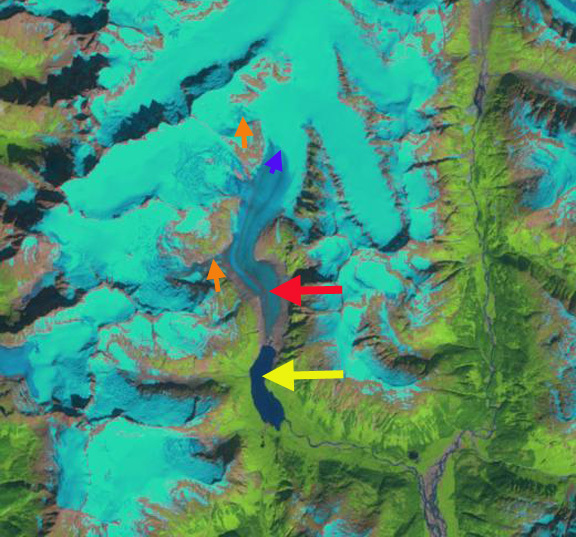 By 2004 the southern tributary at the orange arrow is no longer connected to the glacier. The glacier has retreated 1.3 km from 1984-2004. The snowline is at 950 m with a month left in the melt season. 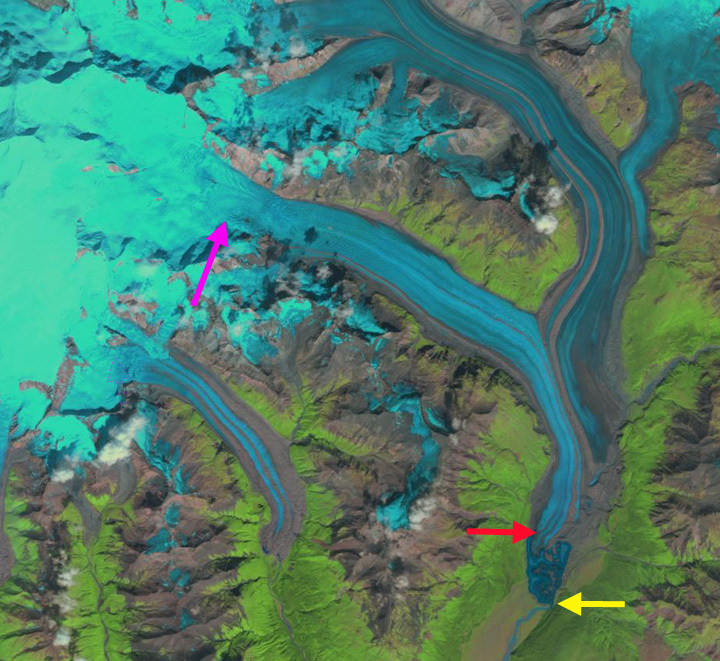 In 2009 the image is not great quality, but the northern tributary is still connected to the main glacier by a thin tongue of ice at an icefall at 850 m. By 2013 the northern tributary is no longer connected to the main glacier, there is bare rock extending across the full width of the former icefall area. 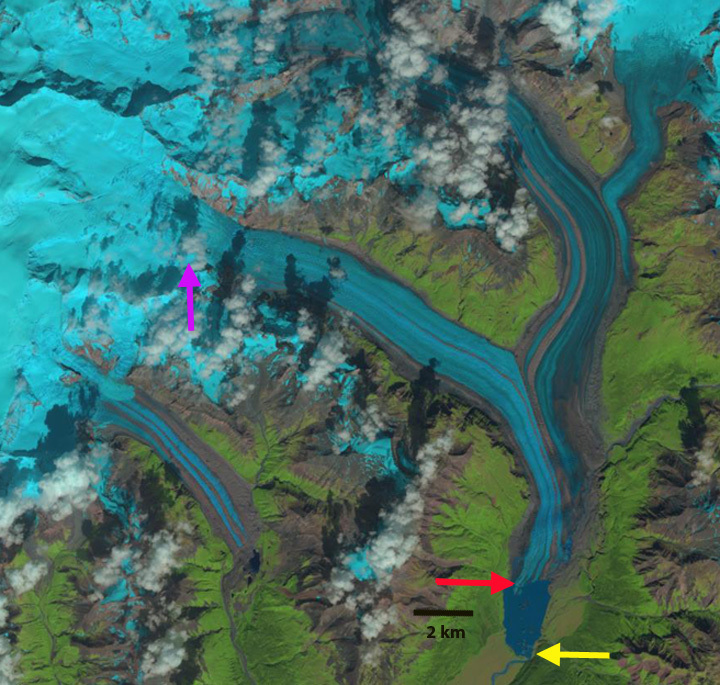 In 2014 the image is from the end of July and the snowline is already above 950 m. It is evident that the glacier will lose nearly all of its snowcover by the end of the melt season on October 10th. The glacier has retreated 900 meters since 2004, and 2.2 km since 1984. The recent loss of tributaries indicates less contribution of ice to the glacier and that retreat will continue. This retreat is the same as that of nearby Field Glacier, Meade Glacier and Ferebee Glacier. Sovereign Glacier is on the northeast side of the Talkeetna Mountains, Alaska and drains into the Talkeetna River. 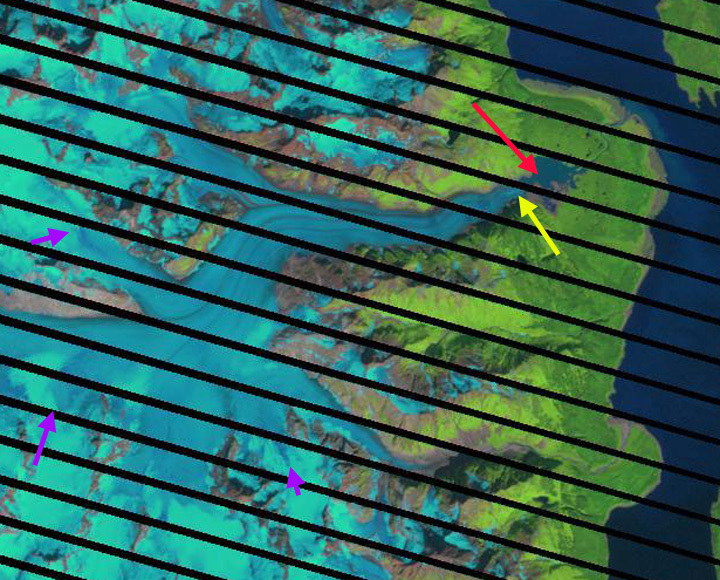 The Sovereign Glacier, red arrow, was joined by a tributary from the south in the map image, pink arrow. Molnia (2007) noted that all glaciers in the region have retreated since the early 1950’s when the area was mapped and that all the major termini were retreating and thinning in 2000. Here we examine Landsat imagery from 1986 to 2014. In 1986 the glacier terminates at the red arrow at the valley junction. 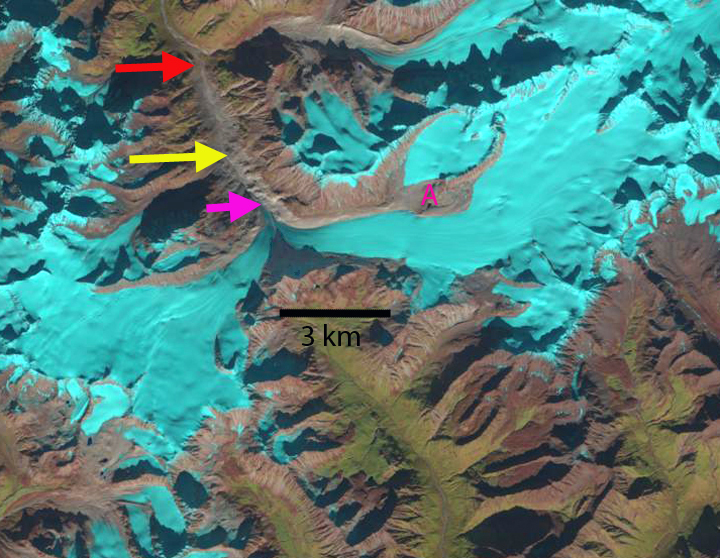 The tributary to the south, pink arrow has separated from the main glacier and ends in a proglacial lake. 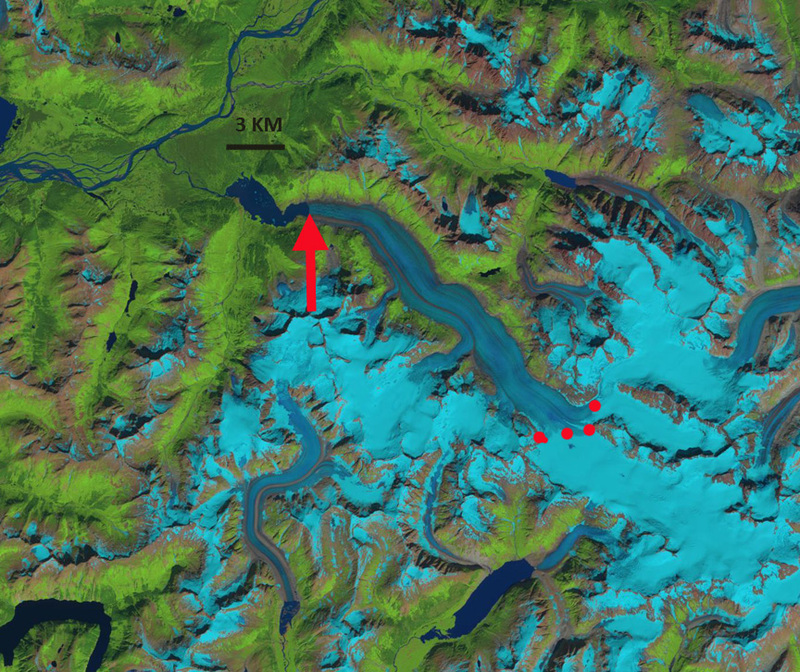 In 1989 retreat is evident during the last three years with an expanding proglacial lake at the pink arrow, and the glacier terminus no longer reaching the valley junction, red arrow. 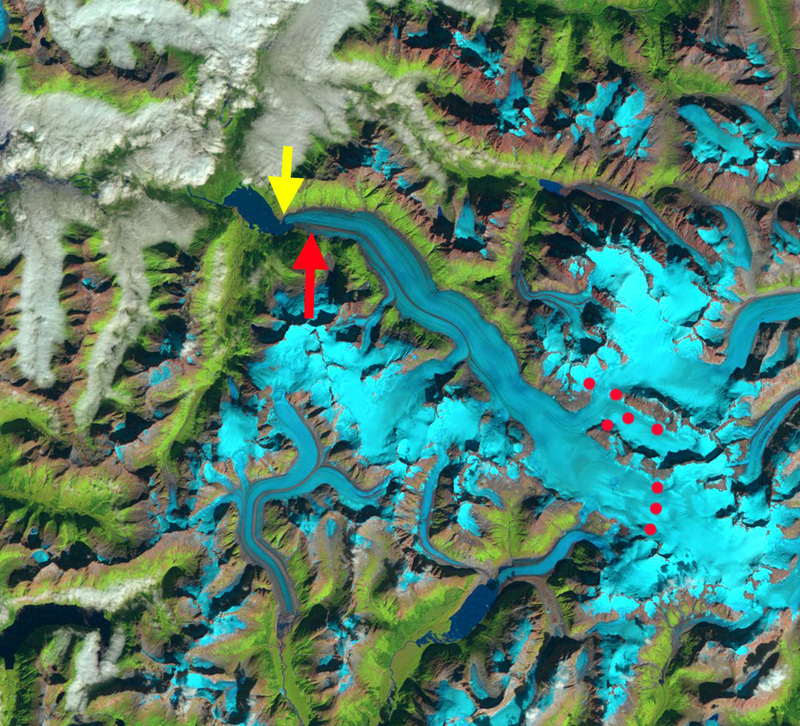 By 2001 the glacier has retreated most of the distance from the red arrow at the 1986 terminus location to the yellow arrow, the 2014 terminus location. The former tributary glacier has receded from the proglacial lake. 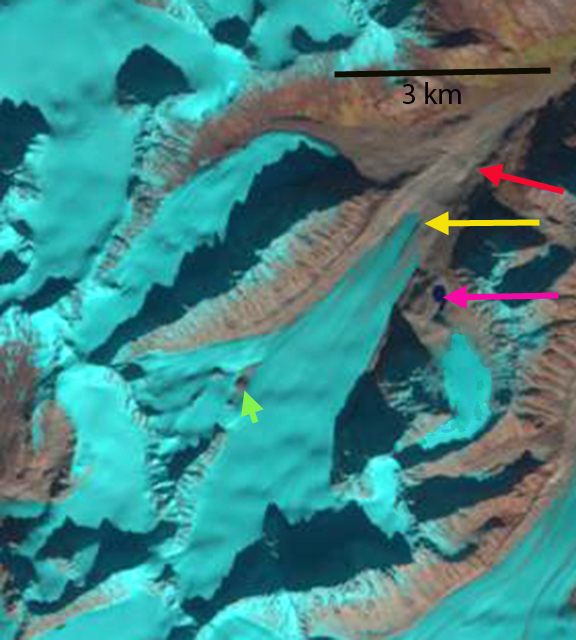 In 2009 there are two new outcrops of bedrock in the upper portion of the glacier indicating glacier thinning near the equilibrium line at 2000 m, at green arrow. 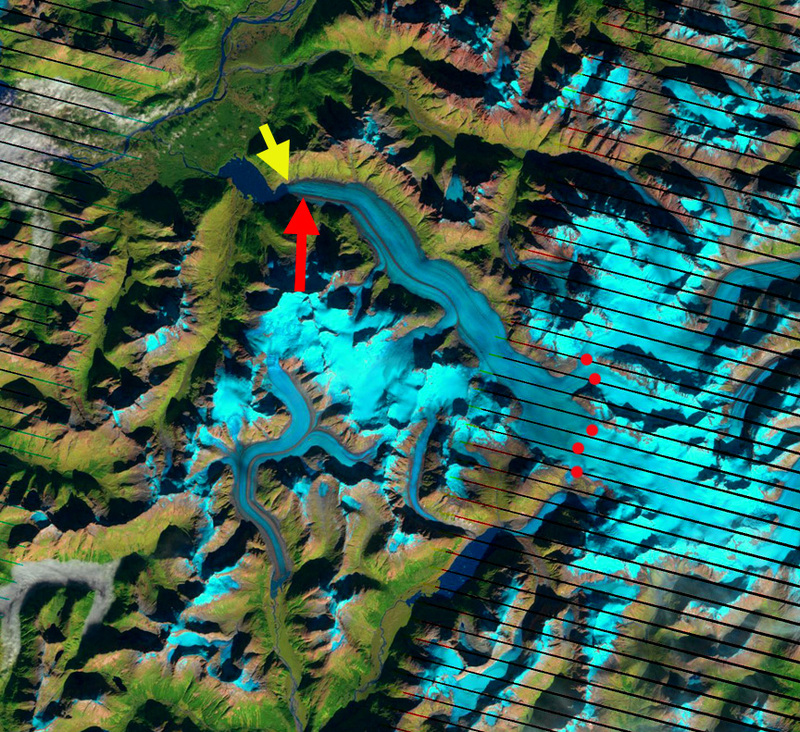 By 2014 the main glacier has retreated 1100 m from the 1986 position, red arrow, to the yellow arrow. 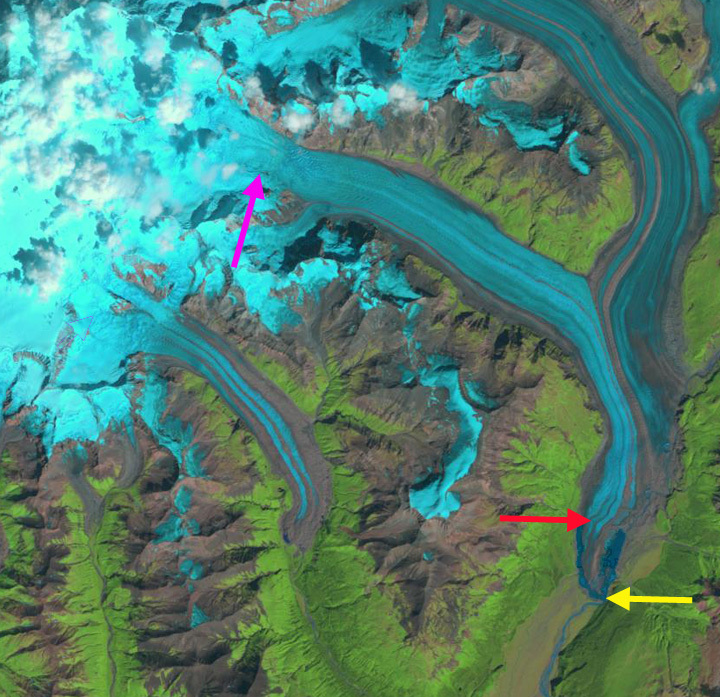 The tributary glacier at the pink arrow has retreated 400 m since 1986. 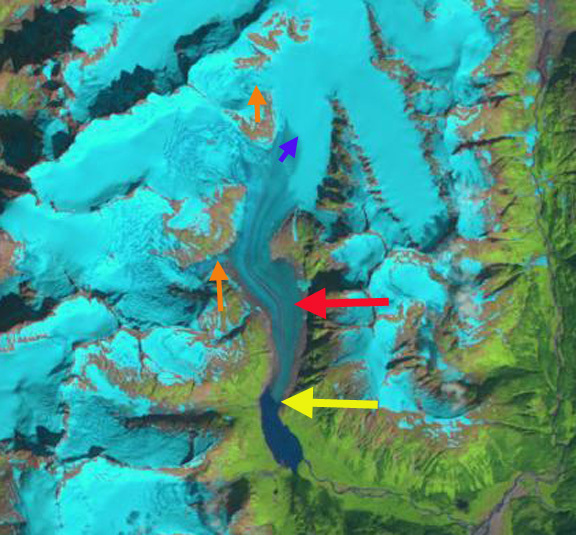 The green arrow indicates further thinning of the upper glacier since 2009. The thinning upglacier indicates that retreat will continue. The retreat parallels that of nearby South Sheep River Glacier. 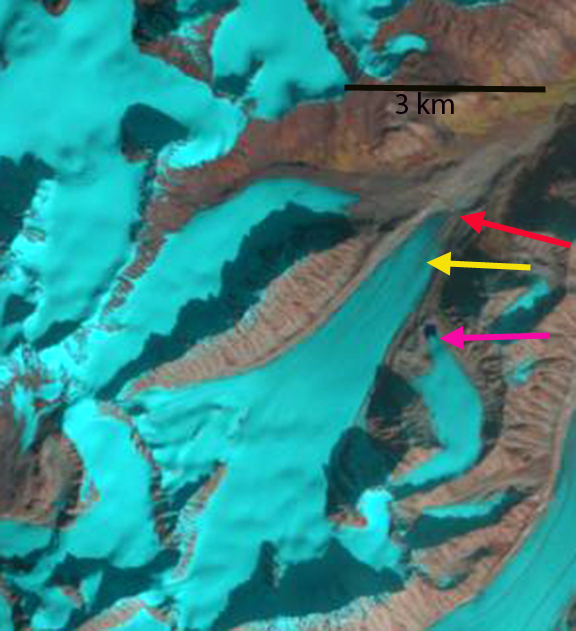 This thinning in the upper glacier is similar to that of Lemon Creek Glacier as well (Pelto et al, 2013). South Sheep River Glacier is the informal name of the longest glacier in the Talkeetna Mountains of Alaska. This glacier is the headwaters of the Sheep River and is comprised of two major glacier branches from the east and west meeting and turning north down the Sheep River valley. 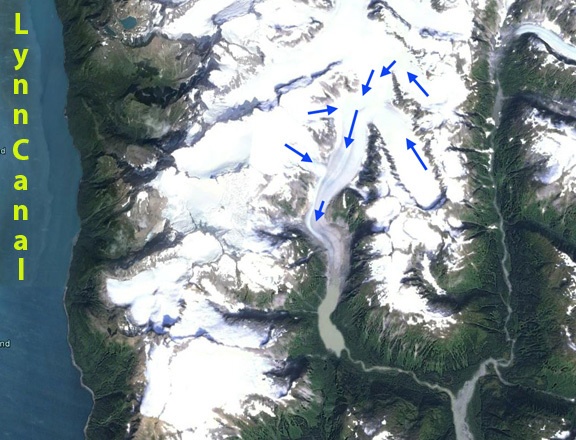 Molnia (2007) noted that all glaciers in the region have retreated since the early 1950’s when the area was mapped. Molnia (2007) noted that all the major termini were retreating and thinning in 2000. Here we examine Landsat imagery from 1986 to 2014. 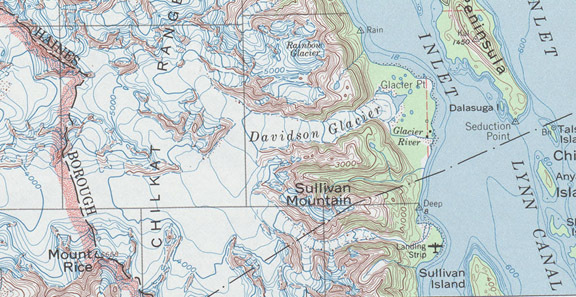 In the early 1950’s the glacier extended 5.5 km north down the Sheep River Valley from the main glacier junction, red arrow. 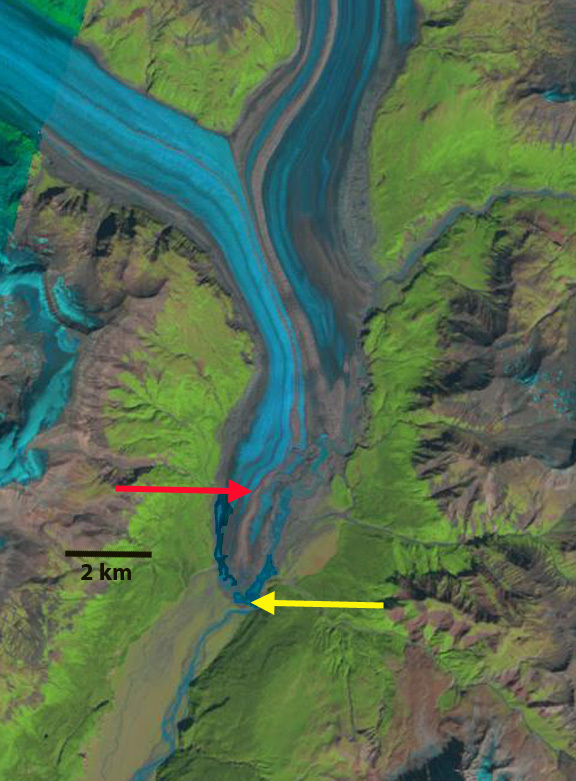 Fourpeaked Glacier drains east from the volcano of the same name in the Katmai region of southern Alaksa. 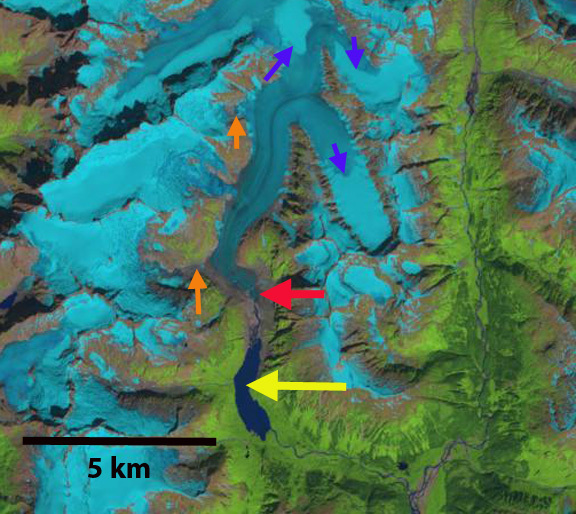 The Park Service in a report (Giffen et al 2008) noted that the glacier retreated 3.4 km across a broad proglacial lake that the glacier terminates in from 1951-2986, a rate of 95 m/year. From 1986-2000 they noted a retreat of 163 m, or 13 m/year. In a more recent report with the Park Service Arendt and Larsen (2012) provide a map of the change in glacier extent from 1956-2009, Figure 4, but note the poor data overall on historic changes of Fourpeaked. 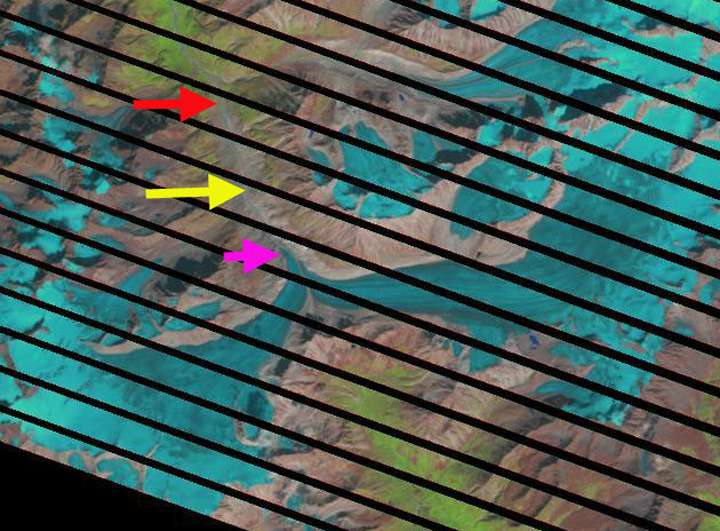 Here we utilize Landsat imagery to examine retreat from 1981 to July 2014. A Landsat 2 image from 1981 with relatively low resolution indicates much of the proglacial lake still occupied by ice, but much of this is floating icebergs detached from glacier, which is hard to distinguish in this image. In each image the red arrow is the 1985 terminus and the yellow arrow is 2013-2014 terminus. 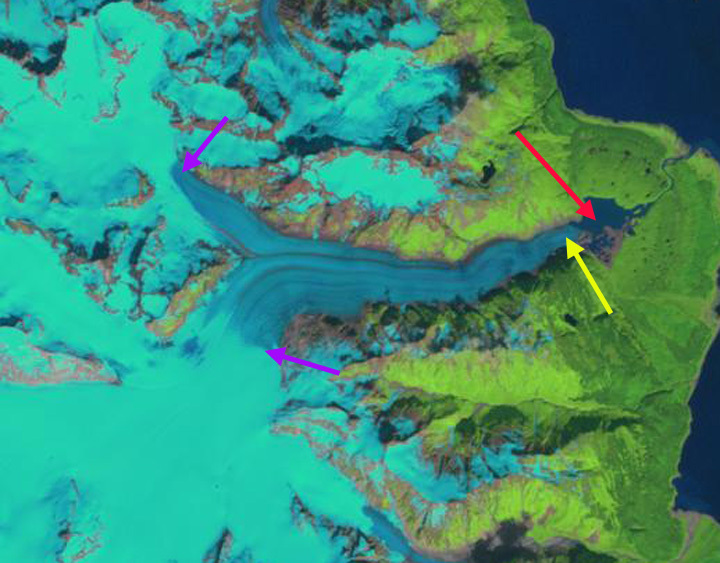 In 1985 the terminus is at the red arrow, with considerable floating ice still evident that is not part of the glacier. The snowline, purple dots, is at 750-800 m though this is not near the end of the summer. By 2000 the floating ice is gone, and the terminus has retreated into a narrower inlet. 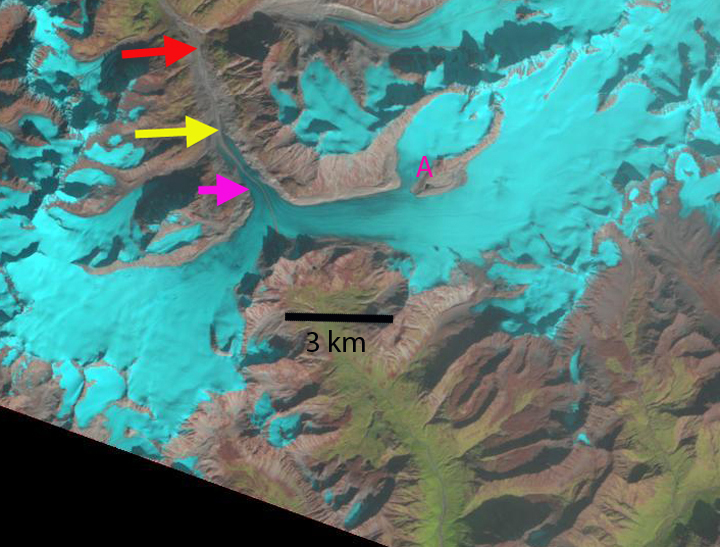 The snowline is at 850 m. By 2013 the glacier has receded further up this inlet and the width of the lower glacier is less. This is a July image and the snowline is still relatively low. In the July 2014 image the snowline is quite high at 700 m, given that this is mid-summer. It is not apparent in the Landsat image, but the large local forest fires in the spring could reduce albedo and enhance melt this summer. The terminus has retreated 1.9 km from 1986 to 2014 a rate of 68 m/year. The retreat from 1981-2000 was fed by calving in a broad proglacial lake. From 2000-2014 the retreat has continued despite the narrowing of the calving front. That the glacier has narrowed even more and thinned in the lower reach is indicative of a retreat that will continue. 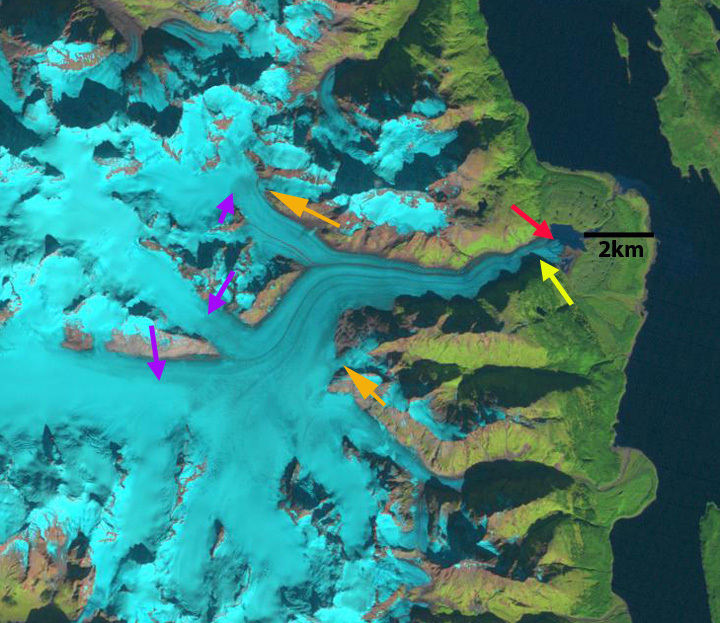 This glacier is behaving like other Katmai area glaciers, Giffen et al (2008) noted that 19 of 20 are retreating. 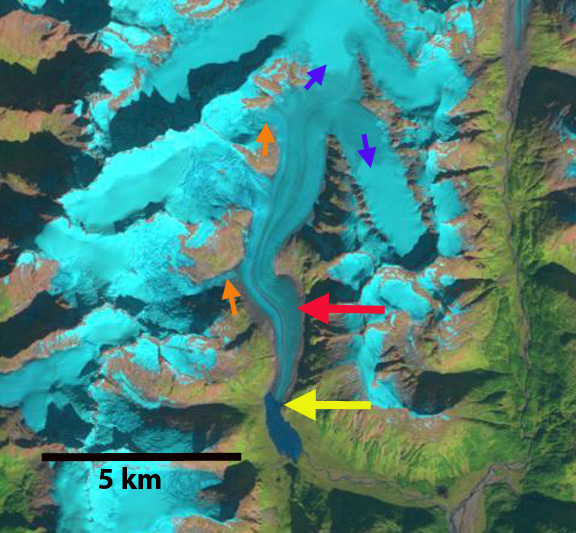 The glacier retreat has led to formation and expansion of a large lake much like other glaciers in the region; Bear Glacier, Excelsior Glacier and Pedersen Glacier. 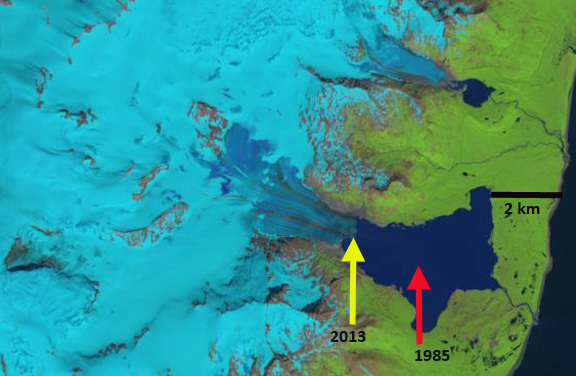 The last image is an animated gif created by Espen Olsen illustrating the change in the glacier. Wright Glacier is the main glacier draining a small icefield just south of the Taku River and the larger Juneau Icefield. 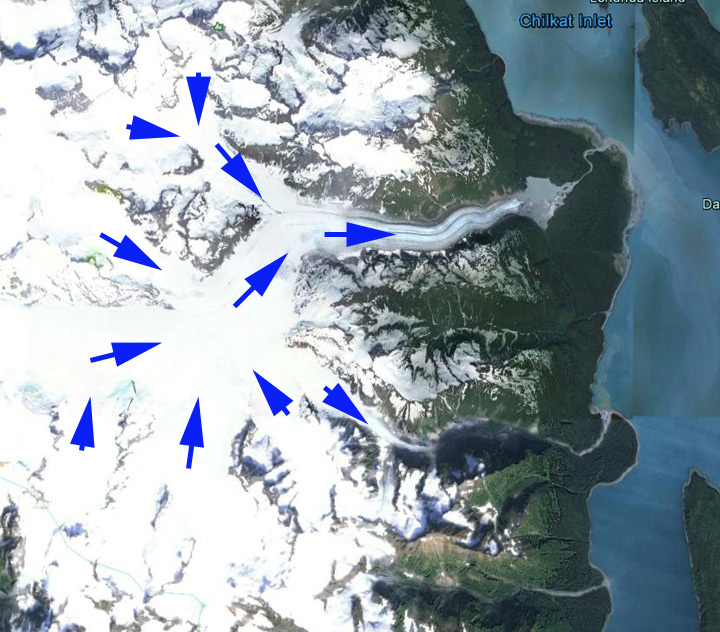 Wright Glacier is 60 km east of Juneau and has ended in a lake since 1948. 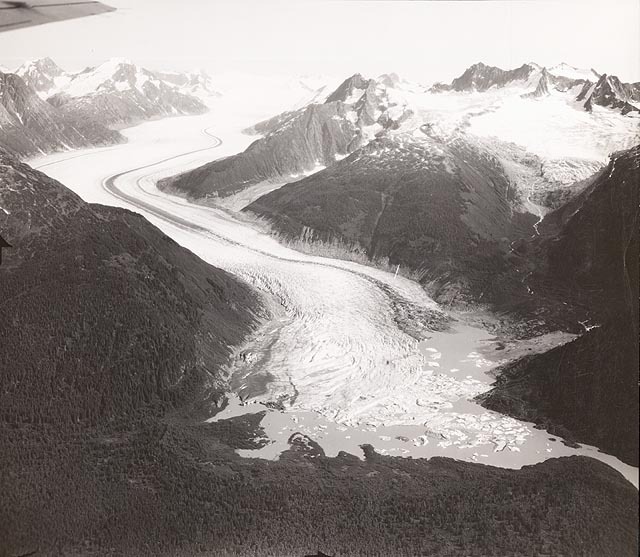 A picture of the glacier in 1948 from the NSIDC collection indicates the terminus mainly filling the lake, but breaking up. The glacier drains the same icefield as the retreating West Speel and Speel Glacier. 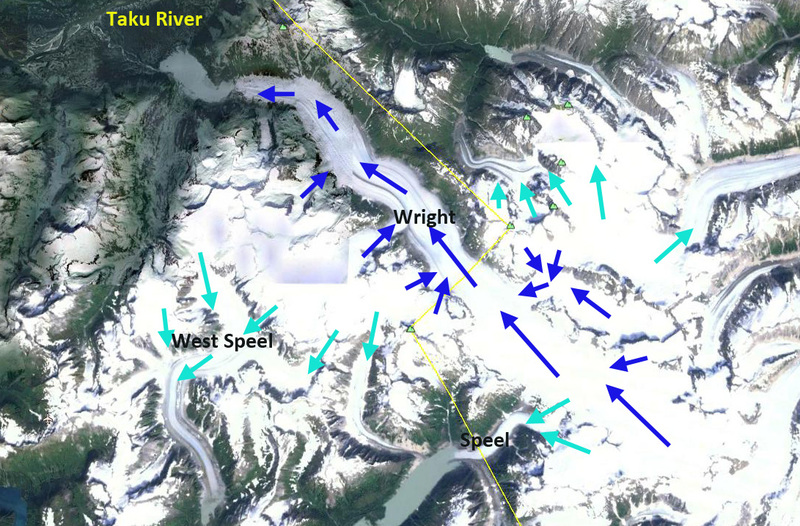 The dark blue arrows indicate the flow vectors of Wright Glacier, light blue arrows flow vectors for adjacent glaciers. Despite being 30 km long this glacier has been given very little attention, maybe because it does not reach tidewater. NSIDC Glacier Photograph Collection Photographer unknown. In 1984 the glacier ended at a peninsula in the lake where the lake turns east. This was my view of this glacier during the summers of 1981-1984 from the Juneau Icefield with the Juneau Icefield Research Program. Our bad weather came from that direction so keeping an eye on that region during intervals between whiteout weather events, the norm, was prudent. 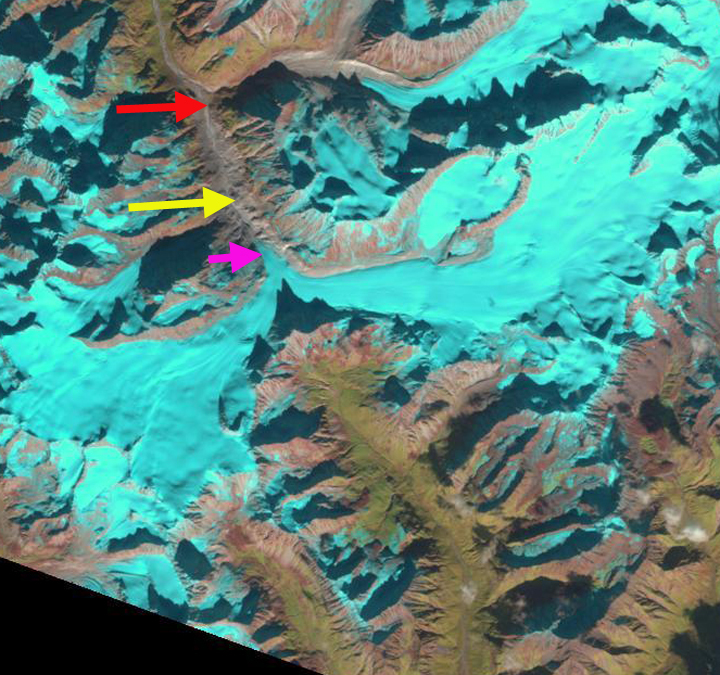 Here we examine Landsat imagery from 1984-2013 to document the retreat of Wright Glacier and the elevation of the snowline on the glacier. 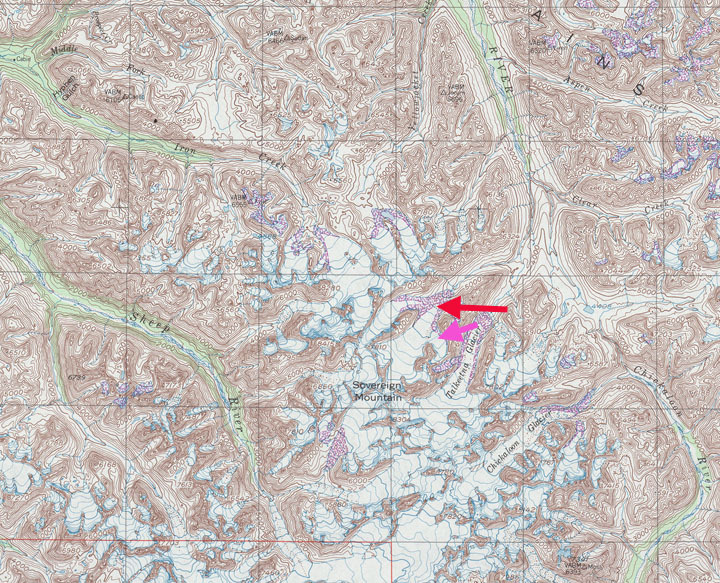 The red arrow indicates the 2013 terminus, the red arrow the terminus at the time of the image and the red dots the snowline on the date of the imagery. In 1984 the lake had a length of 3.1 km extending northwest from the glacier terminus. The snowline in mid-August with a month left in the melt season was at 1150 m. By 1993 the glacier had retreated little on the north side of the lake and 200 m on the south side. The snowline in mid-September close to the end of the melt season was at 1150 m. In 1997 the fourth in a five year run of extensive mass balance losses and high equilibrium lines in the region, noted on the Juneau Icefield (Pelto et al, 2013), the snowline had risen to 1450 m. The terminus had retreated 200 m on the north side since 1984 and 600 m on the south side. In 2003 the snowline was at 1250 m with a month left in the melt season. The terminus retreat on the north side and south side since 1984 had now evened out with 900 m of retreat. In 2013 the snowline was at 1150 m in mid-August and 1350 m by the end of the melt season. The terminus had retreated 1300 m since 1984 and the lake is now 4.5 km long. 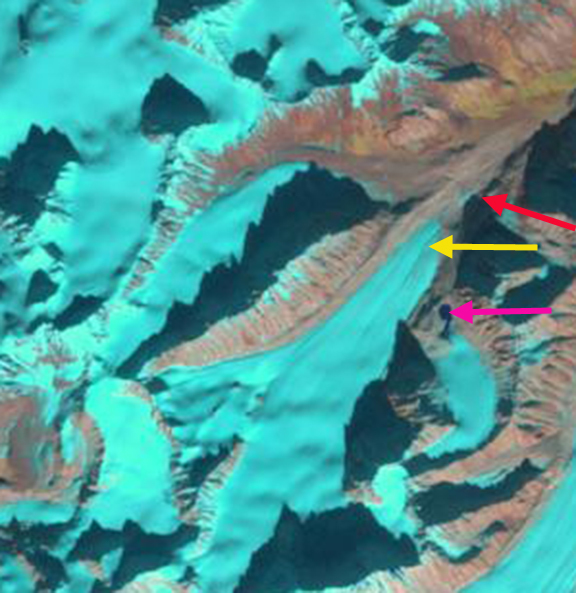 The lower 2 km of the glacier has many stagnation features on it, suggesting continue retreat. 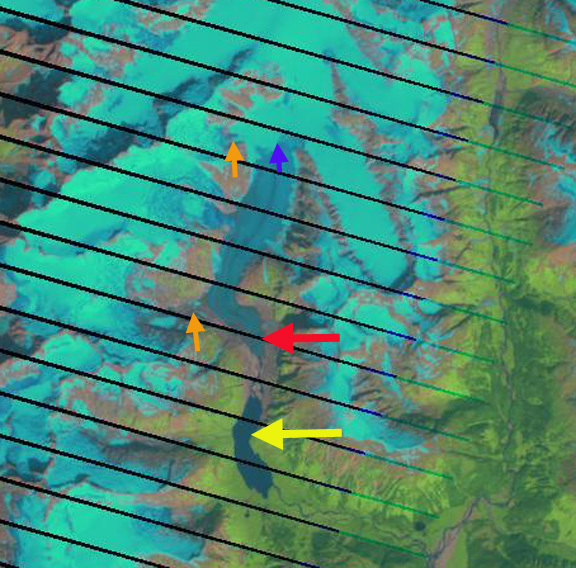 It is unclear how far the basin that will be filled by the lake upon retreat extends, but it is not more than 2 km from the current terminus, as a small icefall reflecting a bedrock step occurs there. 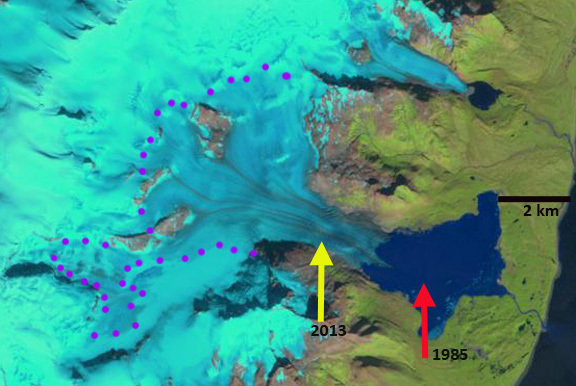 This glaciers retreat has accelerated since 1984. To be in equilibrium the glacier needs a minimum of 60% of its area to above the snowline at the end of the melt season. This is to offset the 10-12 m of melt that occurs at the terminus. This requires a snowline no higher than 1150 m. The snowline has been above this level in 1994-1998, 2003-2006 2009-2011 and in 2013, which suggest the glacier cannot maintain its current size and will continue to retreat. The glacier has a larger high elevation than the West Speel and Speel Glacier that originate from the same mountains. The glacier is following the pattern of retreat of all but one of the glaciers of the Juneau Icefield.